The genus Saccharolobus (formerly Sulfolobus), and related species, are acidothermophilic archaea that live in geothermal hot springs around the world, so their ideal living environment is in near-boiling sulfurous acid. In order to grow the most commonly used species in the Stedman Lab, S. solfataricus, cells are cultured in a sulfur rich media of pH 3.2. We grow the cultures in microaerophilic flasks in shakers set at around 75º C (167º F), and they love it! Different species vary slightly, but most Saccharolobus have a similar ideal pH and temperature. While most of the work in the Stedman lab looks at viruses, we do some work with our main host organism itself - Saccharolobus, and related species. Kuroyu Hot Springs, where our sample came from. Some years back, the lab received a sample from a colleague, R. Thane Papke, then at Montana State University, Bozeman, taken from Kuroyu Hot Springs, in Akita, Japan. 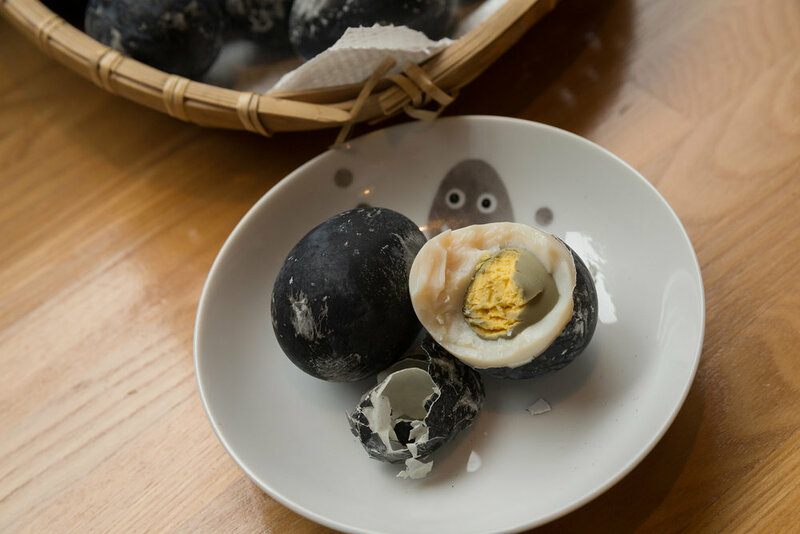 Meaning "Black Onsen" in Japanese, this hot spring turns eggshells black when cooked in its 82º C, sulfur-rich acid water. A YS media plate growing the unknown species (upper left), next to other known Sulfolobales. Note the "fuzzy" undefined edges. 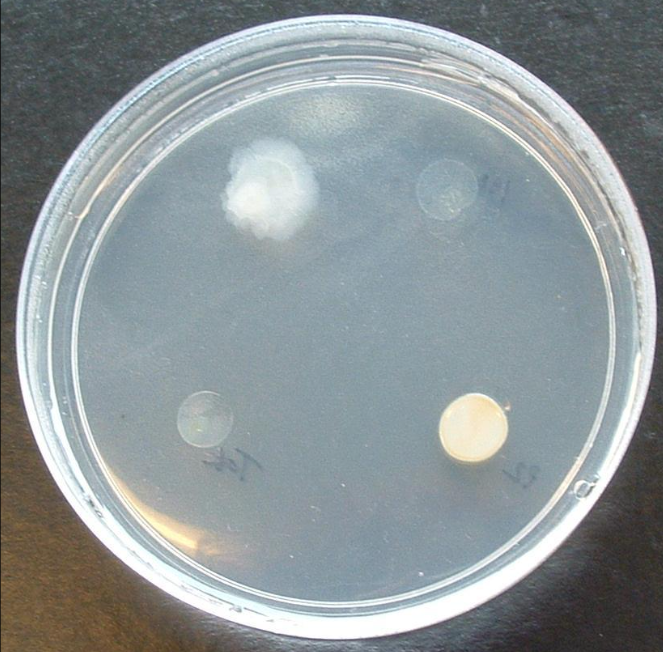 Recently, the sample was taken out of storage to screen for Saccharolobus, but when uncharacteristic colonies with fuzzy edges kept popping up in the cultures, it was thought to be some kind of fungal contaminant. The implications of discovering a hyperthermophilic fungus were exciting, so we looked into these strange "contaminants". When observed under a microscope however, instead of seeing the expected fungal hyphae, what we saw were very Saccharolobus-like cells! Images from the EM confirmed that the strangely fuzzy colonies formed were actually caused by cells that were hyperflagellated. 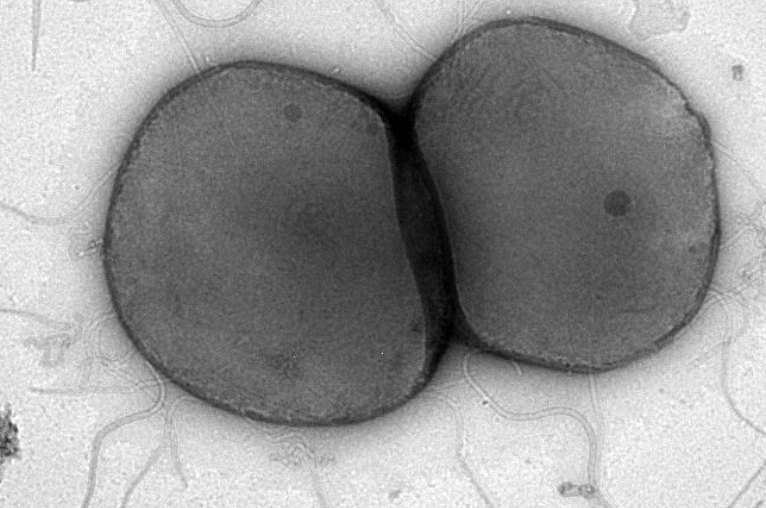 While most Sulfolobales typically have one or a few archaellum (the archaeal flagellum), to encounter a species with so many is unique. Sequencing of the 16S ribosomal gene returned an almost identical match for both Sulfolobus tokodaii (now Sulfurisphera tokodaii) as well as Sulfurisphaera ohwakuensis, however, new sequencing data has confirmed that this is a new and uncharacterized species. Our working name for this organism is Sulfurisphaera mobilis, which describes it as a particularly motile species. Currently, our lab is working towards methods for culturing these cells with consistency. They seem to grow best in microaerophilic conditions, and are much less aerotolerant than S. solfataricus or other Sulfolobales we have worked with. Being able to culture more cells is the first step towards getting clearer imaging done on the cell structure and learning more about it's archaella (the archaeal flagellum). We are also troubleshooting the assembly of it's genome, which, when complete, should shed more light on it's taxonomic place within the Sulfolobales. There are no papers on S. mobilis yet, but we hope to publish these results in the near future.